2/12/96 – We got Sean off to school as usual; Pauline and Susanna are at Orla’s playgroup … [later] Sean was obsessed with a luminous star that Matthew had given him – Pauline and the kids were in Maria’s after school. 3/12/96 – Pauline did her lunch duty – she thinks that Sean is having a bit of a difficult time at school because Billy now plays with Matthew instead. They did pictures/collages of hot air balloons in the afternoon; I have Sean and Susanna’s on the wall in front of me – Sean’s is really very good. 4/12/96 – Pauline had a busy morning lined up – she was to help Ms Kingston get the kids into their silkworm costumes for a dress rehearsal before going to her counselling class … [later] Realized at 1.45 that Pauline might be expecting me to collect Sean, so I took Susanna to his school and he was still there with his teacher, who didn’t mind at all (nor did Sean). 5/12/96 – The concert went well – we left at the interval; Sean as silkworm had been on by then. 7/12/96 – Sean and Susanna headed off to Olivia’s party at 3.30 – it was being held in Pirate Pete’s. This left Pauline and me free to go to the pub – we sat in the Ballinteer House and drank three pints of Guinness each (very pleasant). 8/12/96 – We went into town in the afternoon and parked near St Patrick’s Cathedral, went to the toy shop where a defective pussycat had been bought for Susanna’s birthday and obtained instead a till and snowman/ice-crusher gadget. 10/12/96 – Sean had a circus at his school. 11/12/96 – Sean didn’t have to start school till 10 am; he and I walked down. 13/12/96 – Pauline baked biscuits in the morning and took the kids swimming in the afternoon. Their swimming is going well. [later, at our friends’ house] Donal and I were up latest … By the time I went to bed Susie was in with Pauline, so I slept on a mattress on the floor beside Sean, who was restless and kept me awake with his snoring. 14/12/96 – Pauline took the kids to Sandymount for Sean’s swimming lesson. 15/12/96 – Sean and Susanna were next door for much of the afternoon. 16/12/96 – Sean did some Christmas cards to put on the tree, including one very nice one of which he’s extremely proud. 17/12/96 – Sean, who had been awake late last night because he was thinking about Christmas, was up early and talking about Christmas. He’s very excited about it. 20/12/96 – Sean was up quite early – he’s not getting enough sleep, and he’s hyper because of the Christmas excitement. 21/12/96 – Pauline got up with the kids. We read the papers and all went to the park in the early afternoon; the kids rode their bikes. It was very cold. Then Pauline and I did a big shop in Superquinn while the kids were in the crèche … [later] Pauline had spent a lot of time making dinosaurs as shown on Art Attack earlier. 22/12/96 – In the afternoon I took the kids on their bikes to Sean’s school to tire them out a bit – they rode around in the yard. 23/12/96 – Pauline, the kids and I went to Dundrum in the afternoon and did various bits of business. Took the kids to see Santa. 24/12/96 – The kids were asleep quite early. We prepared the scene for the morning – carrot hanging from the doorknob for Rudolf, etc. 25/12/96 – We were woken a few times by the kids in the night and early morning. They were very good, not insisting on going downstairs or anything. Sean, Pauline and I went down at 7.30. He was thrilled with his presents – ‘Hot Wheels’, a huge pencil and a book from Santa, and a tool set from us. Pauline went back to bed after Susanna had opened her presents – she got a high chair and ‘dancing shoes’ from Santa, and a baby doll (which is life size and can do all kinds of things) from us. She was delighted also. [Later] Sean was working enthusiastically with his tool set, with assistance from Pauline and me. It’s very good. He made a boat (Pauline had got some pieces of wood from Mulvey’s on Monday). 28/12/96 – Pauline and Christine took the kids up a mountain for a walk. 30/12/96 – Went to see 101 Dalmatians in the Ambassador – it was very good. Sean enjoyed it a lot, but it was a bit over Susanna’s head. 1/1/97 – In the afternoon we took the kids and Olivia to the park and played in the snow. Also fed the ducks. I seem to have damaged my back while rolling an enormous snowball. 2/1/97 – Pauline phoned lots of shops to see if she could get a toboggan (Sean had a go on one in the park yesterday). She had no success, but in the afternoon they all played on a hill near Maire’s, and had a go on someone else’s sleigh. 3/1/97 – Pauline took the kids to Dundrum in the afternoon – Aileen had a free party session at Wally Wabbit’s. 5/1/97 – In the afternoon we all went to Bushy Park and had a good walk, then the kids had a good play in the playground. It was still very cold, with a lot of snow around. On our return home I watched Man Utd beat Spurs 2–0 in the Cup. Sean was pleased that United won – he appears to be a fan … [Later] Sean was awake late – his sleeping pattern has become dislocated during the holidays. 6/1/97 – Susanna was first to wake, around 8.45. For the first time she said ‘I want a bottle’ etc. rather than ‘Me want a bottle’. 7/1/97 – Sean went to Billy’s party, in Pirate Pete’s, in the afternoon. He had a great time. 8/1/97 – I woke Sean at 8.10. He has started back at school today. Pauline took Susanna to see a playgroup in Our Lady’s, which impressed them both – Susanna may enrol in it … In the afternoon Phillip was here playing with Sean, or with his tool set – Sean defers to Phillip and allows himself to be bossed. 9/1/97 – Sean was awake late – his adenoid problem makes it difficult to breathe through his nose. 10/1/97 – June was here with Michael – they went with Pauline and Susanna to spend some time at the Our Lady’s playgroup. Susanna loves it, and the others were impressed with it too. 11/1/97 – In the afternoon Pauline took the kids to Sean’s swimming lesson and I went into town … [later] Sean’s lesson had gone well – he’s getting very good at the swimming. 12/1/97 – Sean and I made some ice cream to a recipe in his Kitchen Science kit, although the instructions hadn’t really worked when we tried it the other day so we put it in the freezer instead of in a bowl with ice cubes and salt. Pauline and I read the paper and Sean made a ‘rocket’ with his tool kit … [later, in Marley Park] We discovered the BMX track and Sean went round it twice on his bike – he absolutely loved it … the ice cream, as it turned out, was delicious. 13/1/97 – Pauline took the kids to the park, and Sean went on the BMX track again. After about eight rounds he skidded and fell off his bike, and cried bitterly, not because he was hurt but because one pedal was broken and he wouldn’t be able to go around again. 14/1/97 – Pauline was amused, again, at Phillip and Sean agreeing that something they’d made was ‘a flipping good yoke’, ‘a bloody good yoke’, etc. … they had made a sit-in ‘rocket’ with some help from Pauline … Eleanor rang Pauline and Sean had a conversation with Alan, whom he no longer remembers. 16/1/97 – Sean got some words wrong in his word test, and has to do it again tomorrow before he can get his new reader – Pauline and I agreed that this seems excessive pressure on a 5-year-old. 17/1/97 – Sean and Susanna were at the swimming pool with Pauline in the afternoon. 19/1/97 – In the early afternoon we all went to Marley Park and the kids rode their bikes around the BMX track, Susanna under close supervision (the camber makes her fall off). Sean went round numerous times and tired himself out. Then we went to te playground for a while, and then home. 20/1/97 – The nurse had been to see Susanna today, and had said that she shouldn’t really have more than two bottles of milk per day – Susanna’s reaction was to announce unilaterally tonight that she didn’t want the bottle in this house, and would throw it in the bin. Which she did. 21/1/97 – Matthew and Michael were here to play with Sean in the afternoon. [later] Susie was up late for want of her bottle. 24/1/97 – Pauline got up early. Sean climbed into bed with me and read a book aloud – he’s very proud that his reading has improved, and is willing to tackle any fairly simple book … [later] Pauline and I drank two cans of beer each – thus I broke my alcoholic duck for 1997, and Pauline broke her alcoholic duckling. 25/1/97 – We all went to Sandymount for Sean’s swimming lesson – the first one I’d attended. Sean did well despite leaky goggles – we bought him a better pair afterwards and Susanna had a major tantrum all the way to Ballinteer because we didn’t get goggles for her. 28/1/97 – Pauline took Sean and Susanna swimming in Sandymount. 30/1/97 – Sean had a haircut – his hair is now short all over and he looks much better. 4/2/97 – Showed Sean how to draw a Viking ship. 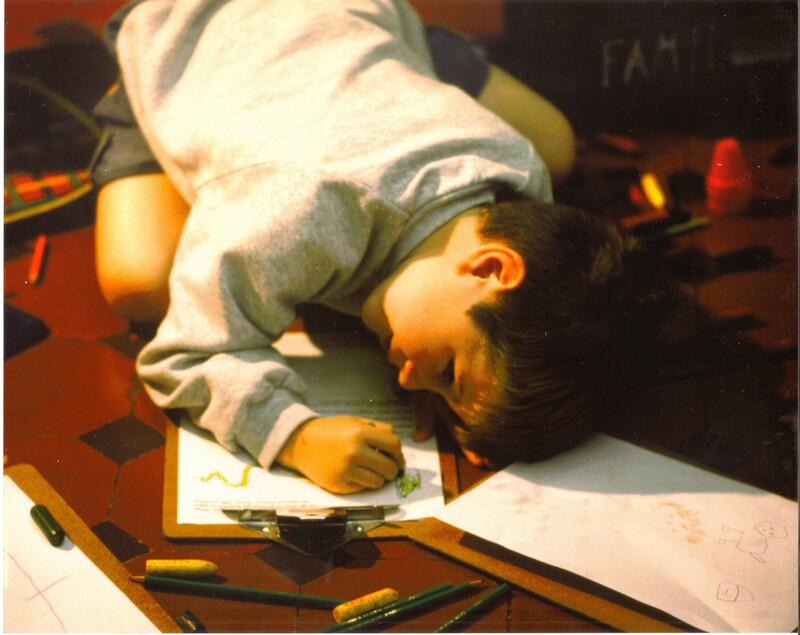 7/2/97 – Sean sat at the computer desk and wrote and illustrated a story in his copybook. 8/2/97 – Went to Bewley’s of Westmoreland Street , then walked along Grafton Street – a juggler set a ball spinning on the end of Sean’s finger … Pauline and Sean went off for his swimming lesson … Sean got his ‘grading’ and will be moving on to a higher level. When he had to swim a width of the pool he swam almost all the way underwater, Pauline says. 10/2/97 – We got the kids out to school. Susanna is totally comfortable in her playschool – Pauline says she marched in, took her copybook from her schoolbag and sat down to write in it in a businesslike fashion, hoping to impress the other kids. 11/2/97 – Sean claimed to have been blamed in the wrong at school for swearing – Pauline thinks he swears to be like Phillip. 23/2/97 – I got up with the kids and went out for a paper. They hammered nails into wood, played with paint and so on. 24/2/97 – Sean had slept in his Batman outfit, and Susanna was partly dressed as Robin this morning before going to playschool. 25/2/97 – Sean played with Phillip and Simon in the afternoon, and for the first time we allowed him to go round the block on his bike and cross the road (at a prescribed point) to get to Phillip’s house … Pauline took the kids to the self-defence class in the Community School – she left Sean there and brought Susie home. It was ju-jitsu, in fact – Sean didn’t seem to like it much, and still wants to do gymnastics … [Later] I watched a programme on the old Muskerry Railway presented by Niall Tóibin. My uncle Finbarr was in a group of old-timers interviewed at length, and extracts from my grandfather’s diary (I think) were read by Tóibin. Very interesting.